First you go outside and catch a chicken. If you can’t catch it, get one of the kids to catch it for you. Pluck it, clean it up and get some stock going with the bird and some vegetables. Then make some pasta dough and pull out your pasta roller. Make some noodles and hang them on backs of chairs all over the house to dry. When your stock is done, cut up the chicken and put it back in the strained stock. Chop up some veggies from the garden and put them in too. When everything’s about done, toss in some of your noodles. And there you go. Now you know why it was so good! That was enough to put chicken soup out of my mind for a long time. But now that I’m in a place to actually consider doing all of that, I think about it often. The things Mom went through to feed all of us good, nutritious food! Dreary Monday in background. 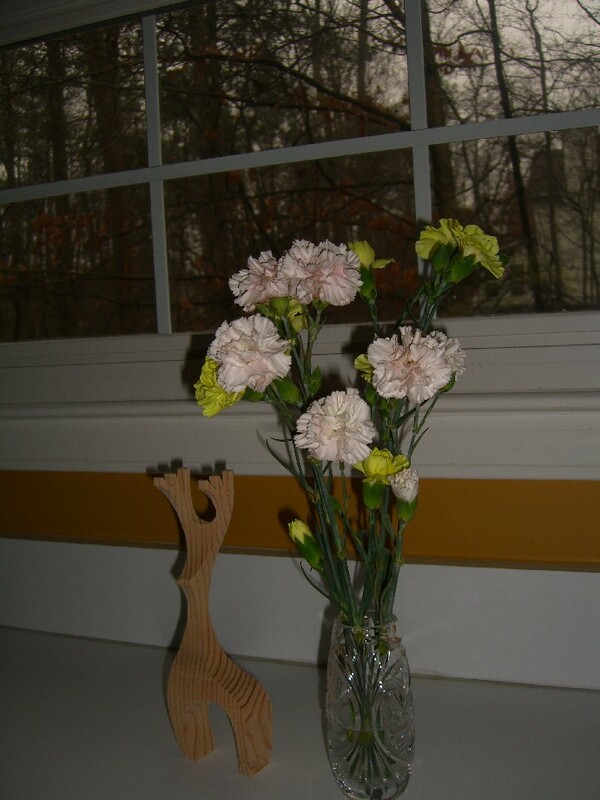 Happy flowers and a little wooden reindeer Test Subject Bill made me brighten the day! While on this dreary January Monday there were no chickens outside my door and no time to make pasta, I did have leftover roast chicken from Nature’s Harmony Farm and some fresh chicken stock that had spent a full day simmering away in the crock pot. I cut up some onions, organic carrots and celery and let them sweat away in a good helping of Kerrygold Garlic & Herb butter. (Generally I like to make anything that has more than two ingredients, but this is such an excellent soup flavoring base…) I had some organic potatoes leftover from the graduation party so I chopped them up and tossed them in as well, added some sweet corn I froze last summer from the farmer’s market, then stirred in my lovely stock. I love inhaling chicken stock. It smells so honest. Homemade stock says love. It says you cannot get this in a drive through. When I think of slow food, stock is one of the first things that comes to mind. I used to make a speedy broth out of How to Cook Everything until I discovered this roast chicken and roast chicken stock recipe from Nourished Kitchen. The broth was good enough….the roast stock is INCREDIBLE. I can (and do) just drink it out of a mug when it gets done. My soup’s final touch – chopped leftover roast chicken – went in the pot and got heated through. Even my suburban version takes some time. Although someday I hope to make it the way Mom did, by stepping outside and chasing down my own bird. I must say I really enjoyed the title of this post. 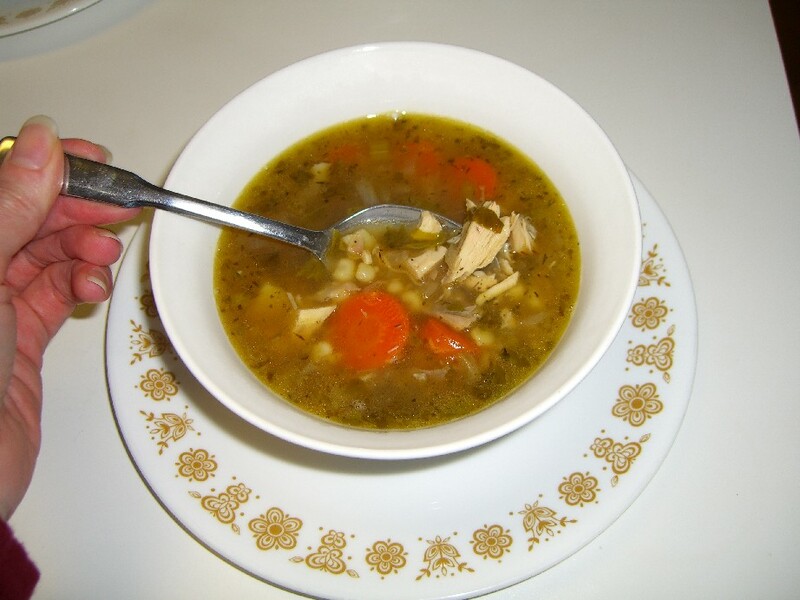 Chicken soup is such a wonderful classic, especially on those cold winter days. I enjoyed this post.